Leading up to Halloween | Does This Font Make Me Look Fat? A couple of weeks ago we had relatives from Philadephia come down to visit. It was a lovely fall day and we went to The Crab Claw for lunch and picked crabs. We sat outside by the water watching what was going on in the harbor. It was lovely. Our friends have an eight year old boy and I was impressed that he was was game to learn how to pick a crab. But his interest flagged and he became fascinated with the claws and how they worked. 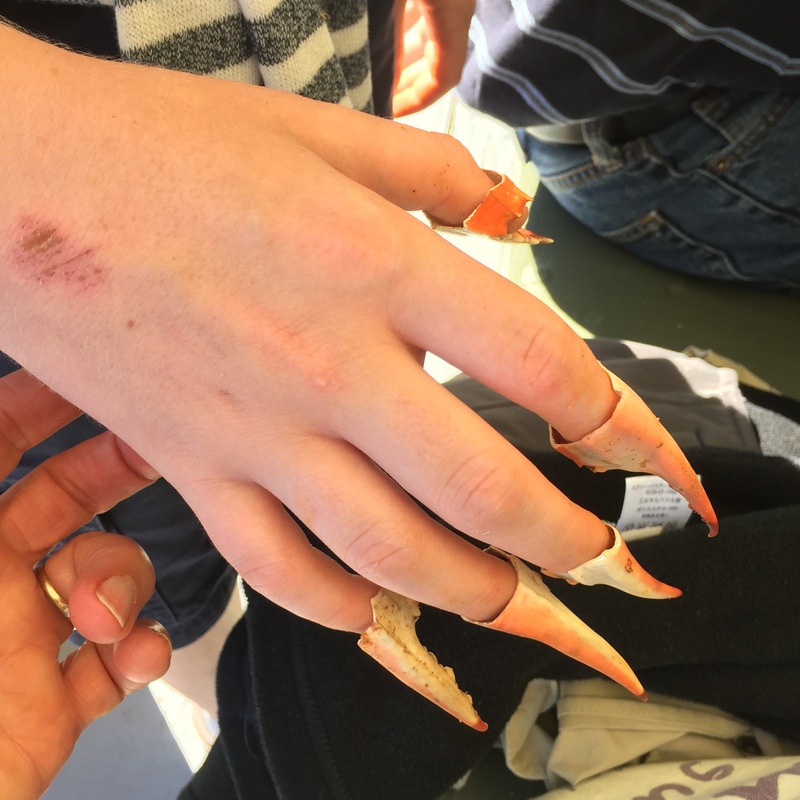 And then, because he’s an eight year old boy, he wanted to make something with the claws. Clever kid. I doubt they lasted until Halloween. We’ve lived in this neighborhood for eleven years. When we first moved here we got 30-40 trick or treaters in the two hour time slot allowed by the town. If you turned your porch light on kids knew they could knock at your door. I began to keep track of how many kids showed up so I’d know how many bags of candy to buy. Having those little candy bars around after Halloween is a problem for me. I swear they call my name. Mala, Mala, Mala. I know I could just throw them in the trash, but that would be only after I had picked out the kinds I liked the best. By three years ago we had 6-10 kids and two years only four. That was way too much leftover candy. So last year we didn’t put the porch light on and we won’t again this year. I hear from people who live in the center of St. Michaels that they get hundreds of kids. I’m not kidding. Hundreds! I guess that’s where all our kids go now. I miss seeing the little ones, but I don’t miss that spooky voice in my head reminding me where I’ve hidden the leftover candy. Coming Up: my adventures with leaf castings with cement. This entry was posted in Halloween, Uncategorized and tagged Halloween, Halloween Candy, St. Michaels MD, The Crab Claw St. Michaels MD by Mala Burt. Bookmark the permalink.